Product Marketing Translation Process | Language Solutions Inc.
Our conversations with marketing agencies and brand managers about translating their product marketing campaigns often start with mapping out the translation process. The process of translating product marketing campaigns is not the same as any regular translation job. Because the content volume is often low, it gives the perception that the translation work should be relatively minor. Many campaigns that reach us have already been heavily invested in the research, writing and testing of the intended message and now it is time to put the message out into the market. However, it is our experience that the shorter the message, the more we need to focus on the writing process to get it right. Here are five aspects by which product marketing translation differs from other translation jobs. We select our teams mostly on the basis of their language and writing skills. We prefer to work with writers that have formal linguistic education over subject expertise, although there has to be some affinity with the subject to understand the message. The translation process for product marketing is better characterized as original writing that is guided by the original message. That’s why we ask clients to provide us with creative briefs that contain detailed information about the target audience and background information on the intended messages that need to be conveyed. Our translators need to be confident in the ability to not only write creatively, but do so in keeping with the spirit of the original intended message. You can have very productive and accurate translators that are subject experts that can translate product brochures, websites or other materials, but may not be the best choice to write your product marketing message in a clear and concise manner. The job of a translator in product marketing is very different than that of a regular translator and who has to specialize more in transcreation. The writing process for marketing materials is often more collaborative and iterative than you would find in other fields or industries. The translation process is guided by the message and the elements that make up the message. These can be defined in a creative brief provided by the client or by facilitating rounds of questions and answers between the translation team and the creative team (on the client end). Most of the time, the message is idiomatic in nature which necessitates a conversation around meaning and intent. Once the intent is clear, translators and editors to work together on ideas as to how this message is best conveyed. The writing process becomes an iterative process between all team members in the translation team to collect feedback on different ideas around a brand promise or a call to action for instance. A good translation team feeds off each others’ ideas during the writing process and are open to critiquing each other’s work. While it is not uncommon for product placement in other countries to have gone through rigorous testing and research in each market (read about our process for Product Name Testing), translators are also interested in learning more about the product, how the brand tries to relate to the potential buyer and what kind of terminology is commonly used among its users in order to produce a translation that meets those goals. If it is a new product that is being introduced into the market, translators may look at similar products in their market and how they are being advertised. Part of the writing process stems from product knowledge and marketing experience, but translators often also research the target audience and how they communicate about similar products to get a sense of emerging terminology. New technology and products often add foreign terminology to the lexicon and translators often have to weigh whether or not they should use these terms. A recent campaign about the marketing of an SUV was discussed and a decision was made on using the English term among our Arabic team as the Arabic translation for “SUV” is rather long and did not fit the character length of metadata constraints and research showed that SUV in English was being used in other car ads in Arabic. Product Marketing Design often pushes the envelope when it comes to traditional language rules. Punctuation and capitalization are a much contended topic when the language is finally being put into layout. Language evolves and it is especially evolving around short marketing campaigns because they tend to set the trend for what is new and exciting, both with the product, but also with the language that surrounds the product. Many marketing campaigns tend to influence the language away from the traditional rules to more colloquial standards. Translators are often the conservatives in the process that like to preserve what is often more correct in the target language. However, translators are not completely isolated from the language trends that also evolve and we see language trends often emerge in marketing translations because they are often the most visible to the public. A good example in Arabic on product packaging was the adoption of a modern looking font that matched the original packaging. While the team debated the need to influence the design based on Western standards, the more modern font was chosen as it was more widely used in local newspapers and therefore it was deemed appropriate for a product that clearly was imported from the United States. Finally, no marketing campaign is complete without the need for SEO and online marketing content often requires additional metadata to be translated for the particular market. This data is often limited in length and takes into account all the information that is gathered about the product, its potential market, distribution, etc. The keywords used are often part of semantic search research that has been done for the original market, and requires some interpretation against the standards by which people search for that particular product in the target language. The work for this can get very involved if the search has to be customized to the target market, but at the very least, the keywords and meta data require the very same insight required to get the marketing right about the product. Looking for a partner that can help you with translating your marketing campaigns in other languages? Discover more about our language services on our Agency Page. 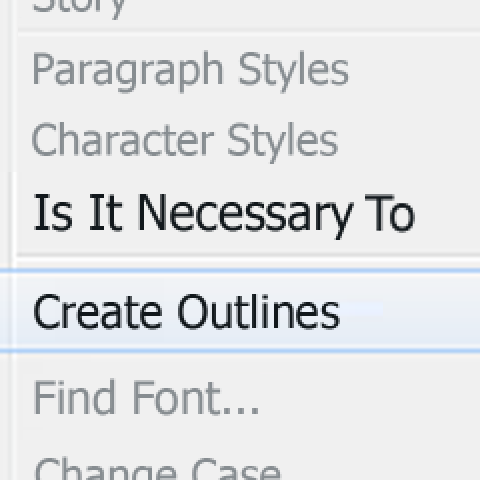 Is it Necessary to Outline Fonts in InDesign?